A new Success Unit and a New Stand Trigger. 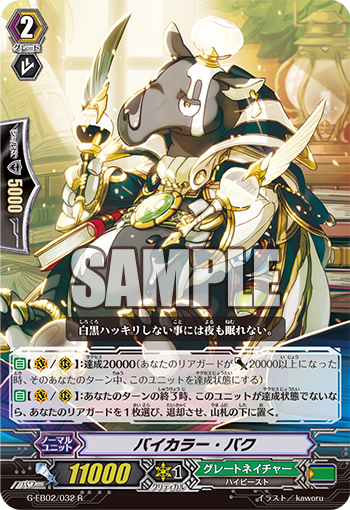 AUTO (VC/RC): When your turn ends, if this Unit is not Successful, choose 1 of your Rear-guards, Retire it, and place it on the bottom of your Deck. AUTO (RC): [Counter Blast 1 & Place this Unit into the Soul] During your End Phase, when another of your Rear-guards is Retired, you can pay the cost. If you pay it, draw 1 card.